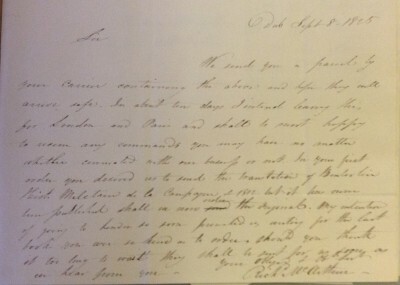 In 1817, Gilbert was now an elderly man and the partnership between Gilbert & Hodges was dissolved. Emily’s grandfather Richard a loyal employee entered the partnership in place of Gilbert and the business became Hodges & McArthur. By now Richard McArthur had began traveling afar sourcing books for a faithful client, Lord Mountbellew, whose large estate was in Co Galway. 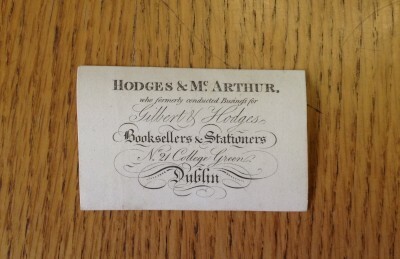 From their correspondence, it is plain to see that they had good business relationship, which seemed to stem from their mutual love and appreciation of books. So much so that on his “honeymoon” in Paris and London of 1825, Richard McArthur still had time to source and send on a shipment of books to the Lord. At the time Richard McArthur traveled between Dublin and France it was easy to buy entire libraries once owned by the fallen French aristocracy quite cheaply, and he may have made a good living by doing so. 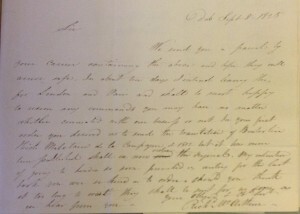 Letter from Richard McArthur to Lord Mountbellew about a book buying trip to London and Paris. Courtesy of National Library of Ireland. Hodges and McArthur (booksellers), and Christopher Dillon Bellew. 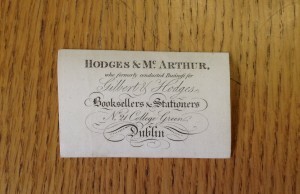 Receipts Etc From Hodges and McArthur, Booksellers of Dublin to Christopher Dillon Bellew. This entry was posted in Family, History, Places on June 23, 2015 by Maria Gillen.